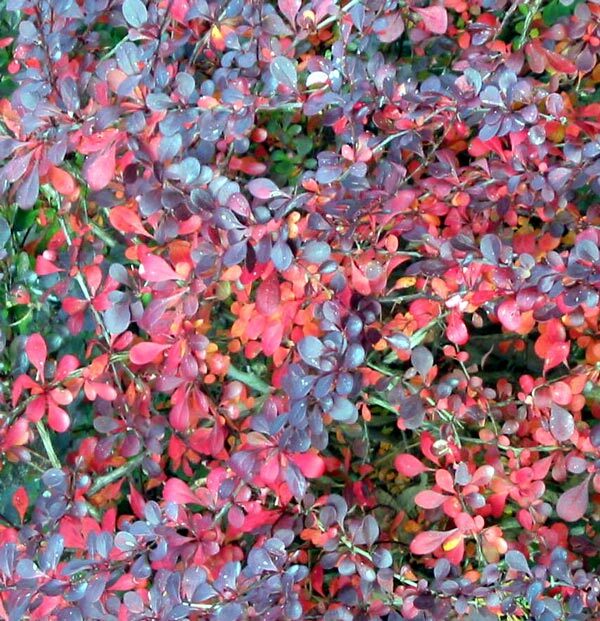 Berberis (Barberry) is a very useful deciduous shrub which adds good red colours to my mixed borders. It is quite thorny, and difficult to prune without thick gloves. Embrace it with caution - Berberis self-seeds! 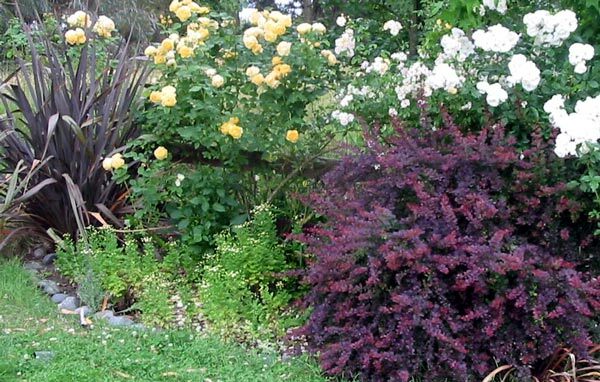 I have different varieties in my garden, but my most favourite Berberis is the plain reddish-purple one. It provides me with seedlings - not too many - which place themselves in unusual positions, thus giving some of my garden designs a daring colour element. Some gardeners would hate this random element, but it suits me and my garden! 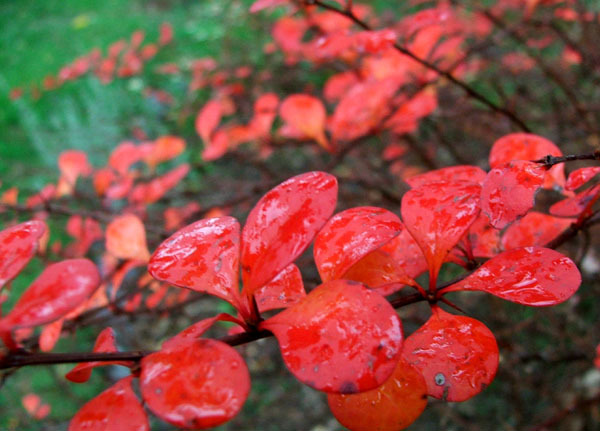 In Autumn these shrubs start to look like burning bushes, with all sorts of flame colours. One of my Berberis bushes turns quite a bilious shade of orange before its leaves drop. The variegated dusky pink-leaved bush in Middle Border is less flamboyant. The Berberis shrub in one of my borders provides a pretty colour combination with its neighbouring roses - and I like the repetition of the dark red colours in the nearby flax. Another is growing right up against a pink Bantry Bay rose, and this colour combination is stunning. A note of caution - I have read in my Fine Gardening magazine that this shrub causes problems in some areas of the USA. Please check local eco-information - and blame those birds who are so good at seed dispersal!